We are a fully licensed, insured, and bonded plumbing company! 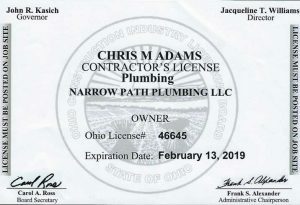 Narrow Path Plumbing is a licensed plumbing contractor providing maintenance on existing plumbing, but we also specialize in new construction. We are licensed, insured, bonded, and proud to offer a full range of repairs for all your plumbing needs. If you reside in Dayton, Cincinnati, or anywhere in between we offer prompt and dependable service. If you are looking for a reliable, honest plumber we are your choice! Call us today at (937) 623-2619 to schedule an appointment. Why is it necessary to hire a licensed plumber? Many unlicensed contractors are not insured and if something was to go wrong this can lead to a costly, lengthy legal battle. Here are a few points you may want to consider if you do not hire a licensed contractor.